aka: “Christmas Pickles” Recipe by Shirley Olson & Terri Olson-Cleveland - These pickles take 3 days to make, but are well worth the wait! We used to eat them like candy when we were kids. They make wonderful Christmas gifts. 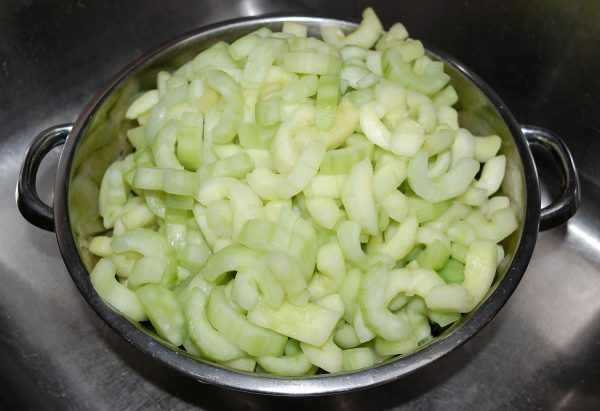 DAY ONE: In the morning, peel the cucumbers and slice in half lengthwise. Using a spoon, gently scoop out the seeds and discard. Cut cucumbers into 1/4-inch half moon slices. 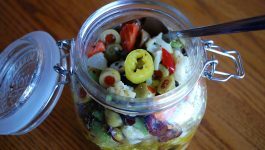 LIME SOLUTION: In a very large non- reactive bowl or container, (I like to use a 5-gallon food-grade plastic bucket with lid) mix the pickling lime with 4 cups of water. Add the cucumber slices; then add more water to cover them. Let stand for 24 hours. It's not necessary to refrigerate or stir the cucumbers during this process. 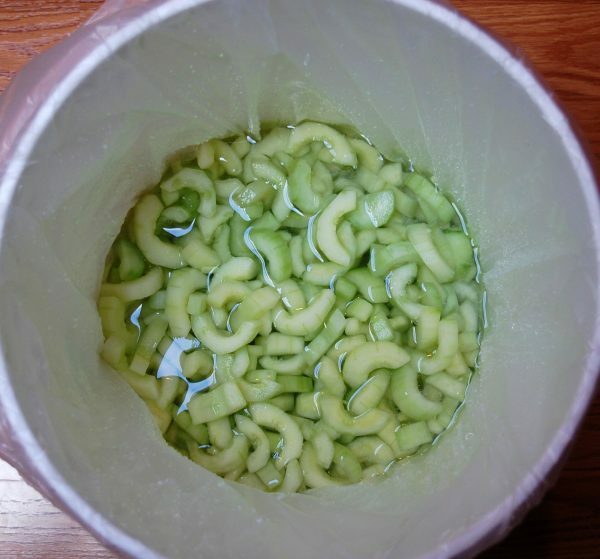 DAY TWO: Drain and rinse the cucumbers thoroughly to remove as much of the lime solution as possible. Return the cucumber slices to the clean bowl or bucket. 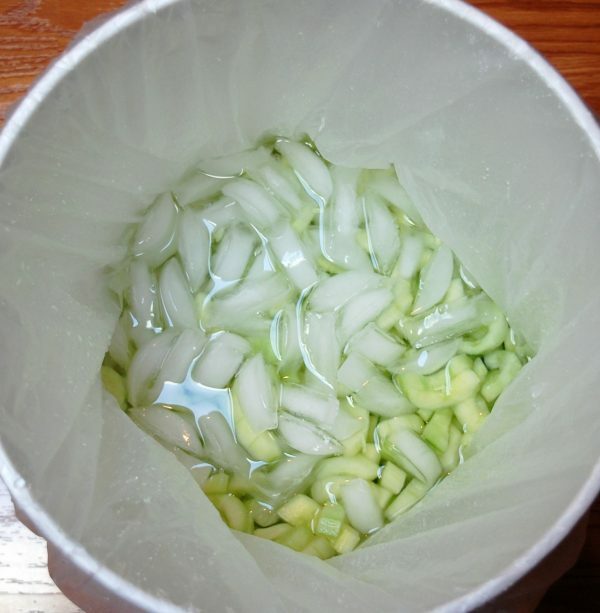 Cover the cucumbers with ice water. Let stand for 3 hours. Drain the cucumbers and rinse well again. All of the lime should be removed from the cucumbers. SIMMERING LIQUID: In a large 8 quart non-reactive pot, mix 1 tablespoon red food coloring, 1 cup white vinegar, and 4 cups of water. Add the cucumber slices and add more water to cover them. Bring the water to a simmer (not a boil) and simmer for 2 hours. Watch carefully to make sure the water does not evaporate so much that you risk burning the cucumbers. Add more water as needed. 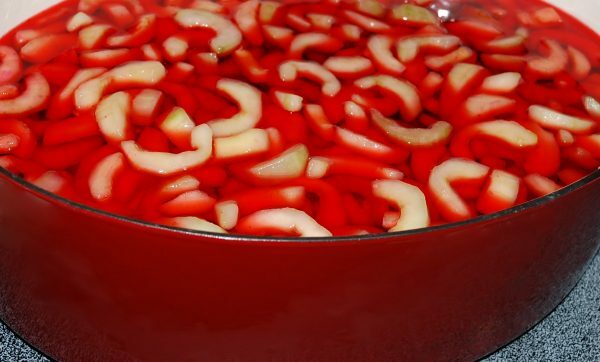 RED HOT CINNAMON SYRUP: Meanwhile, one hour before the cucumber finish simmering, make the Red Hot Cinnamon Syrup in a 5 quart non-reactive pot by mixing 2 cups white vinegar, 2 cups water, 10 cups sugar, 1 teaspoon salt and the Red Hot cinnamon candies. Heat to a simmer and stir occasionally until the candies are dissolved, about 1 hour. Drain the cucumber simmering liquid and return the cucumbers to the pot. Pour the Red Hot Cinnamon syrup over them, and let them stand overnight. DAY THREE: The following morning, bring the cucumbers and syrup to a simmer. 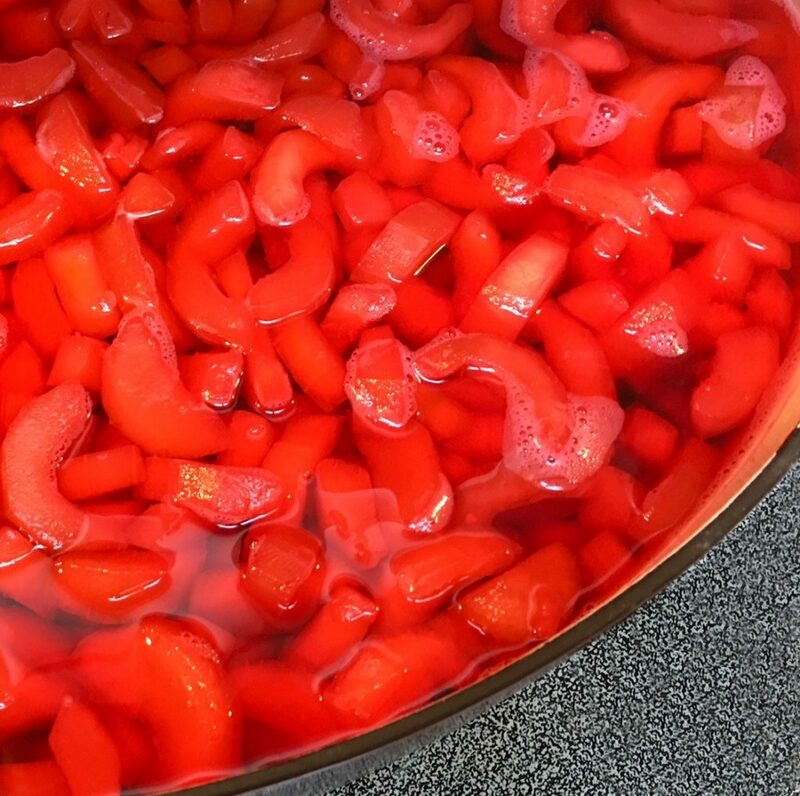 The pickles will be a beautiful red color and have a translucent quality to them, characteristic of pickles made with pickling lime. 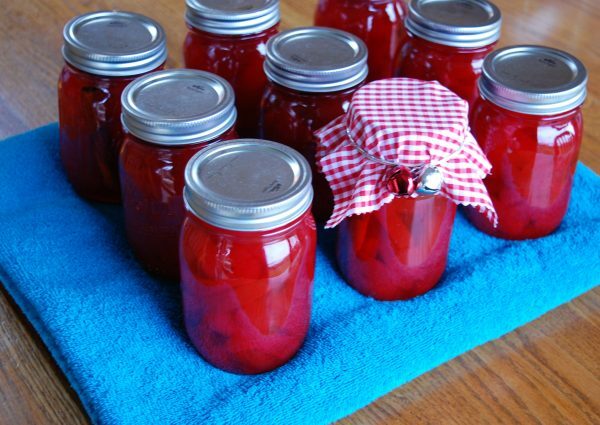 Pack the pickles into sterilized canning jars, cover with syrup leaving 1/4 inch of head space in each jar. Add a stick of cinnamon to each jar. Wipe the rims clean with a damp rag. Cover with sterilized lids and screw on bands finger-tip tight. Process the jars in a boiling water bath for 15 minutes. Pickles are best served cold. 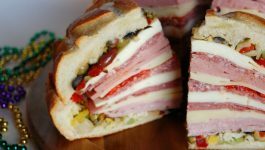 Note: This recipe has been updated and does not call for alum. These are in demand every time I make them. Our cucumbers were destroyed by two hails but we went to Arkansas Valley farming community…actually the little town where my parents lived during war where my father worked as a welder at Pueblo Air Base and bought our cucumbers. They are a little work but so worth when I hand my 76 year old brother in law a jar. He’s a rancher and his mother passed on the recipe….he gives me his wonderful charming smile. Bless our hardworking farmers and ranchers! Making these this week did stir up lots of memories! Bless your heart, Thanks for sharing your story. Do you make them in both red & green? Used your recipe added 2 cans beet juice and monk’s fruit and apple juice, for sweetness and color. Diabetics with cancer in my family even the youngest of grandkids can eat these. Christmas gifts in July they will love it! Thanks for posting most like my dad’s recipe I could find, Veteran of Korean war. Hi Joan, you’re so welcome, I will tell my friend Terri, it’s her mom’s recipe. She has fond memories of making these with her mom when she was a child. We accidently added the ALUM into the first 24 hour soaking with pickling lime! Our cukes turned yellow instead of translucent…Are they ruined or can we still use them just continuing the recipe. Do we need to refrigerate them during any of the processing time up until we put them and the syrup into the jars on the final step? Does the lime solution have to be cool before adding the cucumbers? Hi Julie, I just checked the hand written recipe, it says 8 pints. Thanks! Just missed your reply! I may not have packed my jars as tight. Well, I answered my own question.. lol.. I got 10 pints. Taste great! 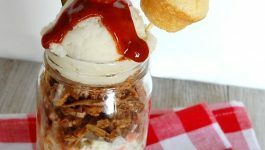 Awesome recipe! Nice and crisp! What do you do with cinnamon sticks ? 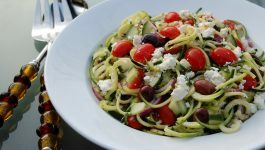 Can you use zucchini instead of cucumbers? I’m trying to make some crisp apple slices instead of cucumbers using the pickling lime. Just for the heck of it. Crisp cooking apples in season right now too so figure if it doesn’t work, I haven’t lost much. I looked up recipes for spicy apple slices which also used red or green food coloring, but apparently that recipe for apple slices only keeps in the refrigerator for ONE WEEK….I meant them to last longer than that so i’m trying the cucumber recipe. Will find out if the pickling lime will work on the apple slices too. Anyway, have my pickling cucumbers sitting in lime for 24 hours. And have a separate big bowl soaking my apples in pickling lime too. My kids grew up eating cinnamon red hot cucumber pickles and they have put in their special request for me to show them how to make them. .will soak all in the alum/vinegar/red food color solutions for 3 hours tomorrow then can it all….apples and cukes separately, of course. I hope someone can help. My grandma always had two pint jars on her table, one green one red. They contained thin sticks, I think cucumbers. What were these? I love to put it in my cottage cheese it adds flavor to it. It keeps forever in the refrigerator. My Papaw used to make them and they are my favorite pickle. Used recipe last year only put pickles in the food processor. Made it relish. Sure great on hot dogs and other sandwiches. I misread and added the sugar, redhots, and cinnamon with the alum mixture. Can I still can them or is the batch no good? I’m sorry Lara, Do NOT can them, you’re suppose to throw out the alum mixture, you’re going to have to start over. What can I eat with the cinnamon pickles? Or what can I mix with the cinnamon pickles? Dessert? Any thing is helpful. Hi Michelle, These sweet and crunchy pickles are great right out of the jar! Serve them alongside sandwich, as an appetizer, on a charcuterie platter, over vanilla ice cream or give away as gifts during the holidays. Hope that helps? So happy to find this recipe. My grandmother would make them every holiday – only she would make a batch with red, and a batch with green. And I would absolutely inhale them! 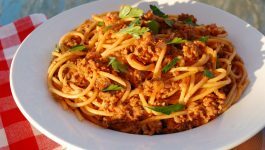 I had the recipe but lost it years ago in a flood, and didn’t get the chance to ask her for it again before she passed last year.